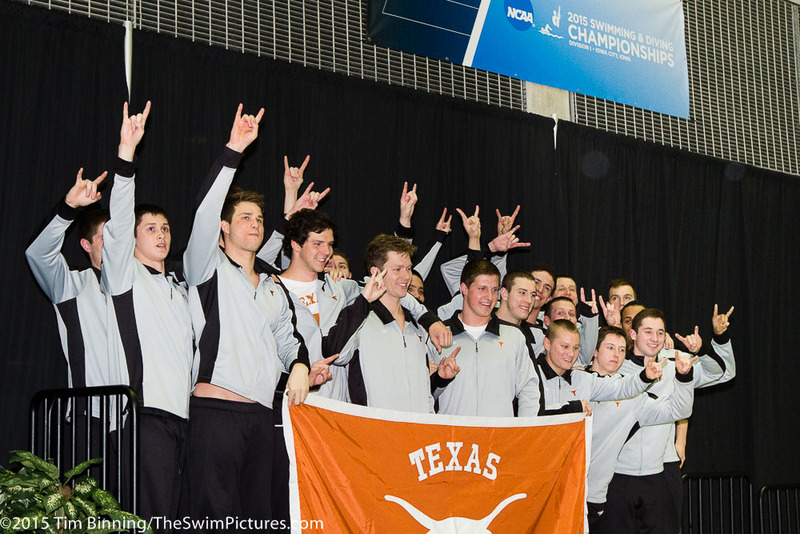 The University of the Texas 200 free relay team of Matt Ellis, John Murray, Jack Conger and Kip Darmody accept their award after winning the event at the 2015 NCAA Division I Men's Swimming and Diving Championships held at the University of Iowa. 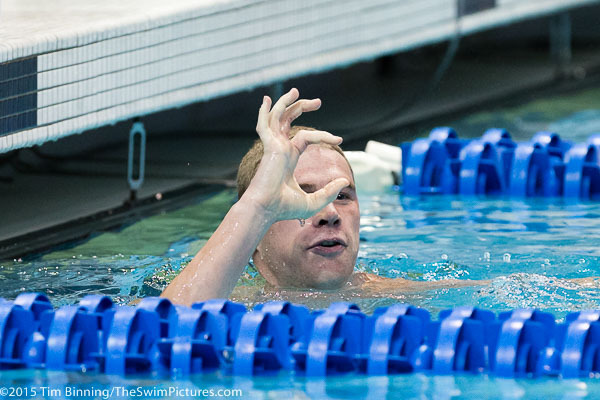 Texas Sophomore Clark Smith reacts to his 4:09.72 winning time in the 500 freestyle at the 2015 NCAA Division I Men's Swimming and Diving Championships held at the University of Iowa. 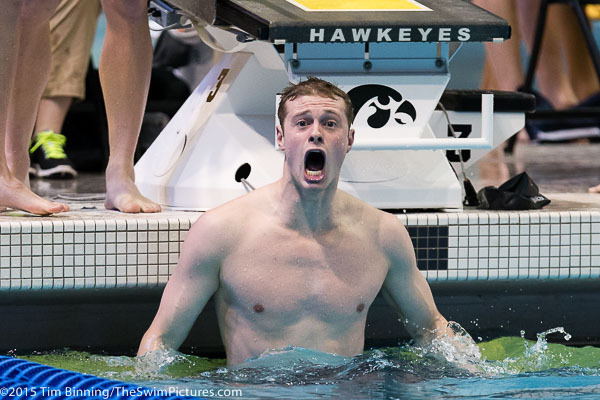 Stanford Senior David Nolan breaks the NCAA and American records with a :1:39.38 in winning the 200 individual medley at the 2015 NCAA Division I Men's Swimming and Diving Championships held at the University of Iowa. 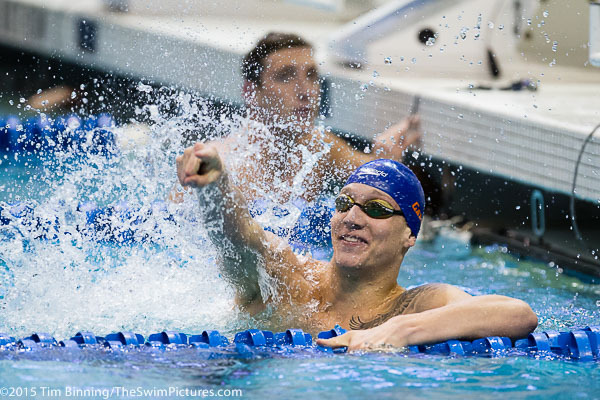 Florida Freshman Caeleb Dressel celebrates a 18.67 victory in the 50 yard freestyle at the 2015 NCAA Division I Men's Swimming and Diving Championships held at the University of Iowa. 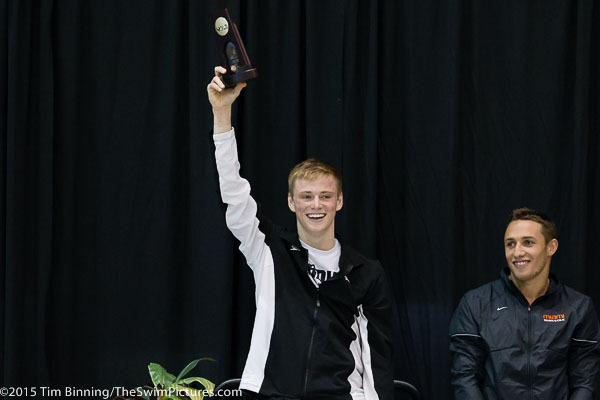 Steele Johnson of Purdue wins the 1-meter diving at the 2015 NCAA Division I Men's Swimming and Diving Championships held at the University of Iowa. 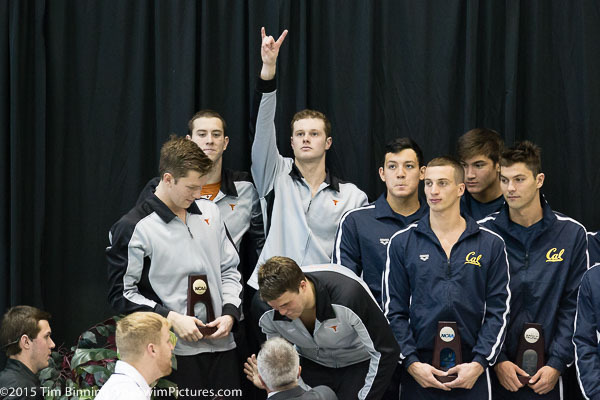 Texas Sophomore Jack Conger celebrates the team's 400 medley relay victory after anchoring the team with a 40.96 freestyle split at the 2015 NCAA Division I Men's Swimming and Diving Championships held at the University of Iowa. 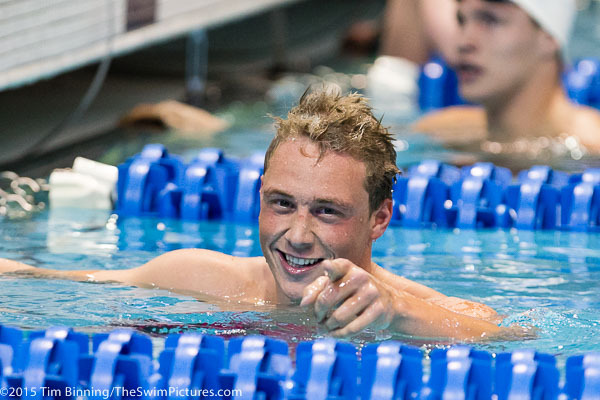 California anchor swimmer Tyler Messerschmidt celebrates the team's victory in the 200 medley relay at the 2015 NCAA Division I Men's Swimming and Diving Championships held at the University of Iowa. 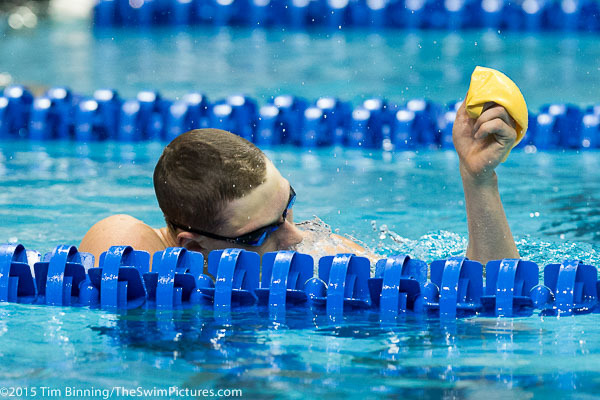 Will Licon, a Texas Sophomore, celebrates his victory in the 400 individual medley at the 2015 NCAA Division I Men's Swimming and Diving Championships held at the University of Iowa. 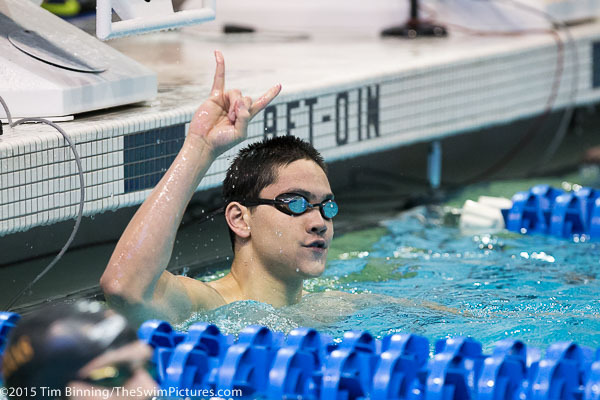 Texas Freshman Joseph Schooling flashes the longhorn hookem after winning the 100 yard butterfly at the 2015 NCAA Division I Men's Swimming and Diving Championships held at the University of Iowa. 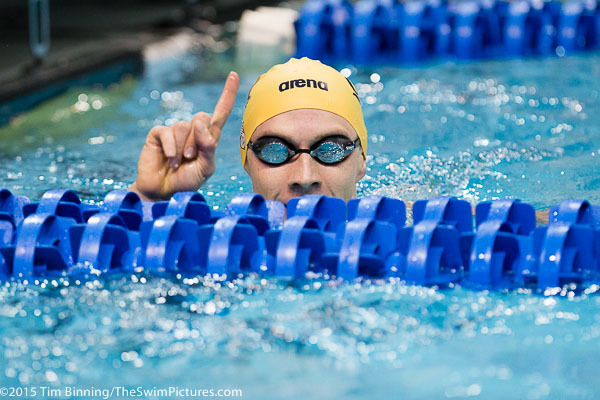 USC Senior Cristian Quintero celebrates a win in the 200 yard freestyle at the 2015 NCAA Division I Men's Swimming and Diving Championships held at the University of Iowa. Arizona Senior Kevin Cordes wins the 100 breaststroke for the fourth consecutive year remaining undefeated in his championship career in the event. Cal Berkeley Sophomore Ryan Murphy wins his second consecutive 100 back championship after setting the NCAA and Championship record in the prelims going 44.17. 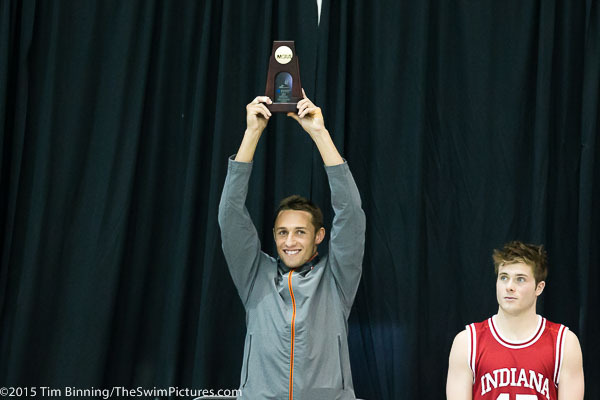 Miami (Florida) Diver Samuel Dorman celebrates a victory in the 3-meter eventat the 2015 NCAA Division I Men's Swimming and Diving Championships held at the University of Iowa. Michael Domagala, Dylan Carter and Cristian Quinjtero of USC celebrate as the team repeats as 800 free relay champions at the 2015 NCAA Division I Men's Swimming and Diving Championships held at the University of Iowa. 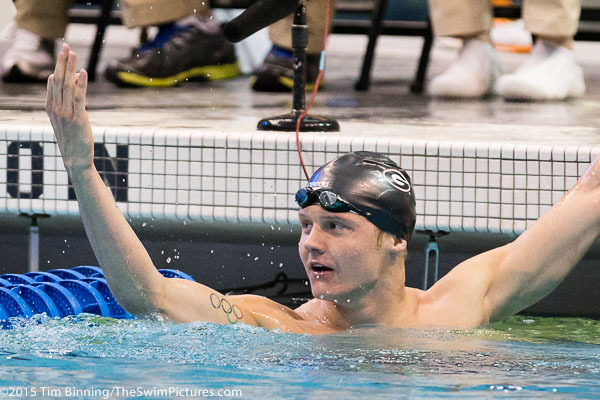 Matis Koski of Georgia Celebrates a 1,650 yard freestyle win at the 2015 NCAA Division I Men's Swimming and Diving Championships held at the University of Iowa. 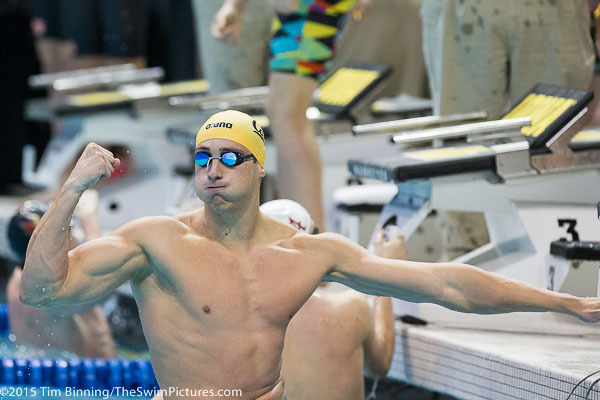 Cal's Ryan Murphy wins the 200 backstroke for the second year in a row going the fastest time in the history andt breaking Ryan Lochte's American record with a 1:36.77 at the 2015 NCAA Division I Men's Swimming and Diving Championships held at the University of Iowa. 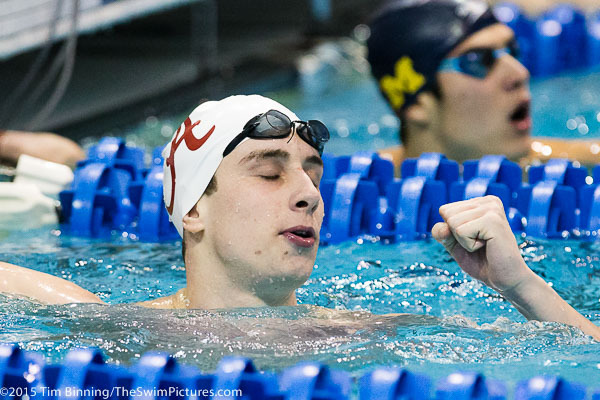 Alabama Sophomore Kris Gkolomeev wins the 100 freestyle at the 2015 NCAA Division I Men's Swimming and Diving Championships held at the University of Iowa. 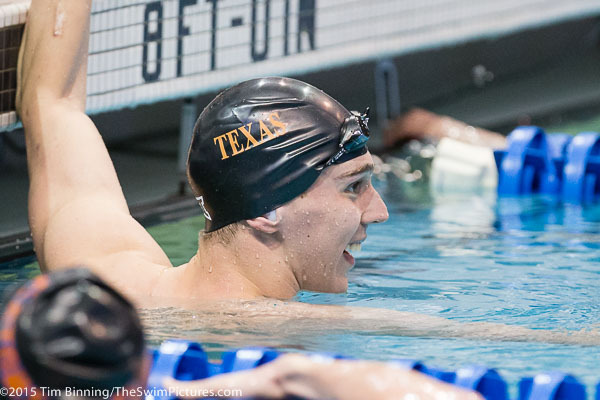 Texas Sophomore Will Licon celebrates his second individual event victory of the Championships after winning the 200 yard breaststroke at the 2015 NCAA Division I Men's Swimming and Diving Championships held at the University of Iowa. 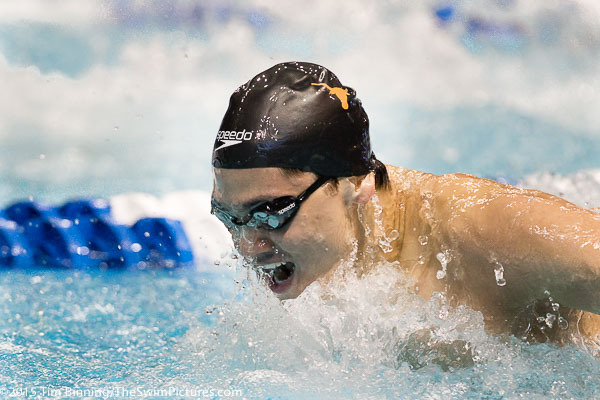 Texas Freshman Joseph Schooling adds the 200 yard butterfly win to his earlier 100 fly victory at the 2015 NCAA Division I Men's Swimming and Diving Championships held at the University of Iowa. 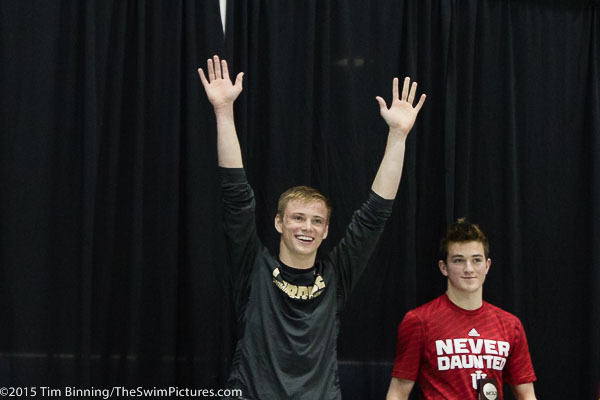 Steele Johnson of Purdue adds a Platform Diving victory to his earlier 1-Meter diving win at the 2015 NCAA Division I Men's Swimming and Diving Championships held at the University of Iowa. USC 400 free relay swimmers Ralf Tribuntsov, Santo Condorelli and Cristian Qintero celebrate the team's victory at the 2015 NCAA Division I Men's Swimming and Diving Championships held at the University of Iowa. © Photos copyright 2015 Tim Binning/TheSwimPictures.com. All rights reserved.